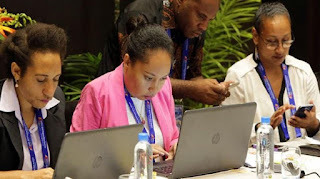 The search has begun in APEC for next generation developers of digital technologies in the Asia-Pacific whose work stands to revolutionize healthcare and the well-being and productivity of the region’s workforce. Nominations are now being accepted for the 2018 APEC Science Prize for Innovation, Research and Education, or ASPIRE Prize, under the theme Smart Technologies for Healthy Societies. Selected as the program focus by Papua New Guinea as APEC Chair, it spotlights breakthroughs developed collaboratively by young innovators across APEC economies that are radically improving healthcare access, quality and outcomes. Examples range from advanced training tools, patient referral systems and traffic management at hospitals and care centers to healthcare provider service and cost assessment channels, rapid diagnoses and remote monitoring of patients, treatments and environmental conditions. “Health is a vital part of economic growth. We look forward to highlighting how digital platforms are being capitalized in APEC to assist the process of attaining effective and efficient health systems for all economies,” explained Dr Teatulohi Matainaho, Chair of the Papua New Guinea Science and Technology Council. Each APEC economy may nominate one individual under 40 years of age for the ASPIRE Prize. The nominees will be judged on the impact of their cross-border research with peers from other APEC economies. Relevant academic disciplines include biomedical technology, healthcare supply chains, point-of-care systems, wearable technology, robotics, nanomedicine, 3D printing and blockchain technology, among others. “In the digital age, new technological advancements are being applied across the health sector, be it crunching big data to optimize diagnoses or leveraging mobile apps to remotely provide care to rural communities,” said Christin Kjelland, Chair of the APEC Policy Partnership for Science, Technology, and Innovation, which administers the annual ASPIRE Prize. “By evaluating impactful health tech innovations coming out of research partnerships in APEC, we aim to better understand and promote how to facilitate the arrival of new and smarter technologies that can keep our people and economies thriving,” Kjelland continued. The ASPIRE Prize will be awarded by APEC officials in Papua New Guinea this August. Wiley and Elsevier, publishers of scholarly scientific knowledge, are sponsors of the initiative. The winner will receive USD 25,000 in prize money. “Technological innovations in healthcare are opening up a whole new realm of possibilities,” added Youngsuk “Y.S.” Chi, Chairman of Elsevier. “Recognizing the work of research pioneers in APEC can help to encourage further breakthroughs in healthcare that support inclusive, sustainable growth in the Asia-Pacific and beyond,” he concluded. For more information please visit: http://www.apec.org/aspire.